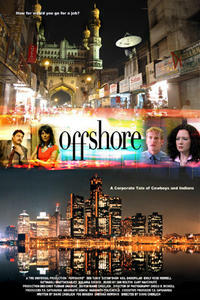 Deb Tunis as Carol, Ratnabali Bhattacharjee as Anjali, Malaika Shenoy as Reva and Neil Bhoopalam as Nikhil in "Offshore." Satish Shah as Devendra Tiwali and Ulhas Phatak as Shastri in "Offshore." Gaurang Vyas as Satish, Emily Rose Merrell as Bridgette and Deb Tunis as Carol in "Offshore." Deb Tunis as Carol in "Offshore." Malaika Shenoy as Reva in "Offshore."